The Mid-Hudson Children’s Museum is the Hudson Valley's best place for kids to explore, move, build, pretend, and create through exhibits and hands-on education. Mid-Hudson Children’s Museum, MHCM, is an independent not-for-profit organization and is the only children’s museum between New York City and Albany. Located in the Hudson River Valley in Poughkeepsie, the museum draws over 70,000 visitors each year with exhibits that focus on early literacy, art, STEM, health and local civics making the museum perfect for younger children developing foundational skills. MHCM was the recipient of the Dutchess Tourism Family Entertainment Award of Distinction in 2015 and the United Way Non-Profit Spotlight Award that same year. In 2016 the museum expanded to include The Science Center to help advance the early STEM education program at MHCM. A Children’s Garden was also added which focused of agriculture and how to grow your own vegetables and herbs. 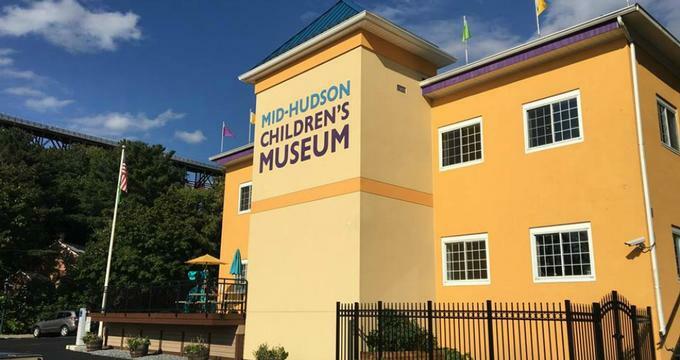 Since opening, Mid-Hudson Children’s Museum has won several other awards including but not limited to awards in leadership, awards from the Chamber of Commerce, and reader’s polls awards in publications such as Hulafrog and Kids Out & About Hudson Valley Reader Poll. Hours vary seasonally and in accordance with holidays, but are listed on their website. Although the website is handicap accessible, it is suggested to leave strollers in the car due to limited space in the museum. The exhibits at MHCM focus on hands-on learning, exploring, building, moving, playing, pretending, collaborating, designing, creating and discovering a child’s world. The foundations of science, the arts, and community are laid and exhibits are open ended which allow children to explore these skills further with help from parents. The exhibits are all also 100% screen free and parents are encouraged to put away their smart phones while in the museum. Early Learning Junction- This area is perfect for children infant through age 4 and includes smaller exhibits that focus on developing skills children need to get ready to attend school such as language, learning styles, emotional development, literacy, and general knowledge of their world. There are exhibits that develop skills such as climbing and crawling, a train table, a news stand, and other toddler based activities. Imagination Playground- Designed by a NYC architect, this playground is made from giant blue foam blocks that can fit together to build structures. This block play teaches critical skills such as spatial reasoning, math, social skills, and problem solving. Build houses, animals, or entire cities, this area is completely open ended. My Backyard Adventure- In this area kids are introduced to fossils and what we can find under the earth. The replica of the Hyde Park Mastodon can be found here, along with sand box play. Rivertown- This town allows children to play make believe and explore future occupations as firemen, bakers, construction workers, and artists. There is an art studio with a different activity to enjoy each week and a special park designed just for babies with padded mats and enclosed spaces called Caroline’s Baby Park. The Science Center at MHCM was launched to further the museum’s dedication to STEM education in the Hudson River Valley community. There are two components of The Science Center. Link, Lift, Launch- This part of the center focuses on flight, rocketry, space and magnetism. In this area, adults and children will explore exhibits that encourage skill development in problem solving and critical thinking. Visitors will have to link, lift and launch their way out of exhibits. There will be special challenge cards at exhibits for learners who wants to expand their learning of STEM topics. WonderDome- The place for place, the WonderDome includes 9 individual, hands-on sensory exhibits. All the exhibits in the WonderDome explore light and color. Children will be able to create art with light while developing fine motor skills and coordination. These exhibits can also offer therapeutic play and a quieter space. The Children’s Garden was brand new summer of 2016 and is a place where families can learn about gardening and how to grow their own fruits and vegetables. The garden is meant to teach visitors different planting techniques and allow them to practice. They can also learn how to do their own composting, learn potting methods, and practice gardening techniques. There is also an outdoor classroom. The Children’s Museum is one of the most popular locations for birthday parties in the area and they offer several packages to fit a variety of needs from first birthday to themed hosted parties for young children, do-it-yourself and private after-hours events. Please call the museum directly for more information.